Besides delivering monstrous sound with the utmost powerful thumping bass, Boombox is the most powerful portable Bluetooth speaker.  It has four active transducers and two powerful radiators incorporated. Enjoy uninterrupted 24 hours music on just a single charge. It has a high capacity 20,000mAh rechargeable battery. The Bluetooth is of 4.2 version which provides connectivity to up to two smartphones or tablets. The rugged up handle provides you a proper grip. JBL BoomBox Portable Speaker is IPX7 rated and so, can withstand even the most epic pool parties. You can switch between indoor and outdoor modes in order to optimize sound according to the location. 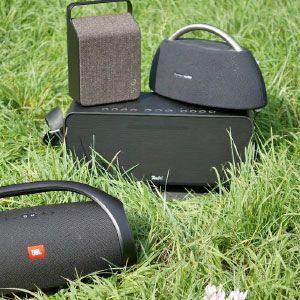 If you are having a huge party and need highly amplified music, you can connect more than 100 JBL Connect+ enabled speakers with Bluetooth with just a single press of a button. You can now optimize your sound from indoor to outdoor mode depending upon where the party is. When indoors, enjoy deeper bass and richer sound and switch to outdoor mode to enjoy strong bass and expansive sound.The output power is 2*30W in AC mode and 2*20W in battery mode. Connect up to two smartphones or tablets and you can now take turns with your friend to play powerful stereo music. The Bluetooth version is 4.2 which uses lower energy but delivers clear and powerful sound. The Bluetooth transmission power is 0-9dBm and its transmitter frequency range is 2.402-2.480GHz. It has four active transducers, that is, two 4-inch woofer and two 20mm tweeter, and also two JBL bass radiators. With these kinds of specs, Boombox portable speaker delivers the utmost monstrous sound along with thumping and the hardest hitting bass. To further add, you won’t be just hearing the bass but also see and feel it. 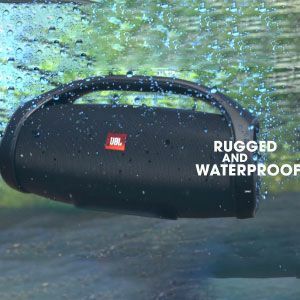 With a rating of IPX7, Boom Box Bluetooth speaker can withstand rains, spills or even submersion in water. Take it along to the largest pool parties without any worries. It can endure any weather and stay beside you in any beach or pool party. It has a built-in high capacity 20,000mAh Li ion rechargeable battery which stays with you 24 hours on a single charge. The battery charging time is 6.5 hours and the music plays continuously for as long as 24 hours. Also, it can charge devices through dual USB ports. 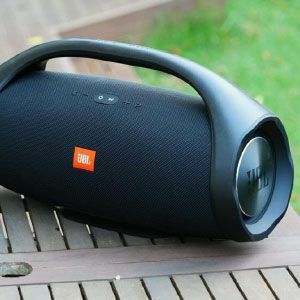 If you are having a huge party and need a lot of loud music, use JBL Connect+ feature of this device and connect more than 100 JBL Connect+ speakers under Bluetooth range. Enjoy amplified music and rock the party with your JBL Boombox. The Bass of this Speaker is just like you Expect to be. 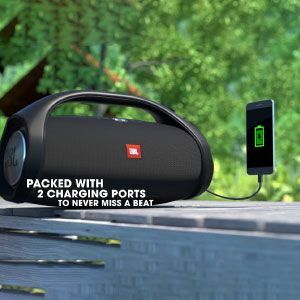 Clearly jbl boom box most powerful portable speaker at this Price Point and Specifications . 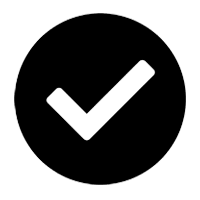 The Sound is Clear , The Clarity Perfect, andSo is the Connectivity Got This Product within 2 Days of Order. Truly Saying, This is the Best Speaker I've ever bought online . 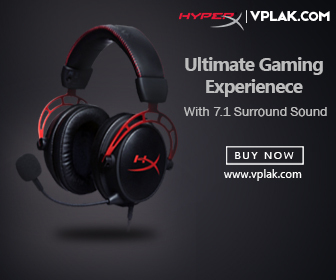 The sound quality is crystal clear and Bass is Just Uncomparable and Awesome . This Is the Best Product for those who want bass , Crystal Clear Sound, Portability as well as High Battery Life. Thanks to Vplak for such a great service. 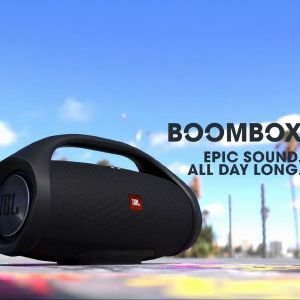 The product JBL BoomBox is the most powerful speaker which has fulfilled my expectations with its performance and the sound quality and clarity is the best part of this product, I love the playtime of 24 hours and this is what makes the product best. Premium Quality, Great Bass , Sound Clarity, Great Service is what you expect from JBL and this product surprisingly doesn't makes you expectations go down. I truly Love this product It has got everything that i expected. I bught it 5 weeks ago from vplak.com and o regrets. Very very fast within 4 days from bangalore to U. P. BASTI. This black big bluetooth speaker is just wonderful, Its bass is really loud. 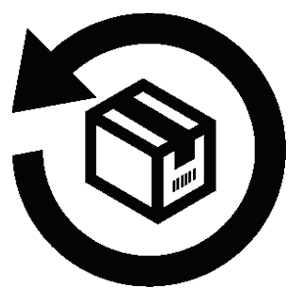 I buy online from vplak at best deal price online in India. Happy to got in just 3 days. Purchased JBL Boombox at a very cheap rate online on Vplak. The speaker's sound quality is very good. The connectivity is outstanding. 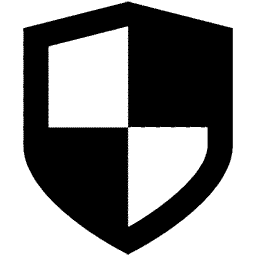 Provides good battery backup. The design and the body type is study making the bt speaker more durable. The balance btw bass and treble results in good thumping sound. Best speaker for partying with friends. Thanks for delivering the product in time. 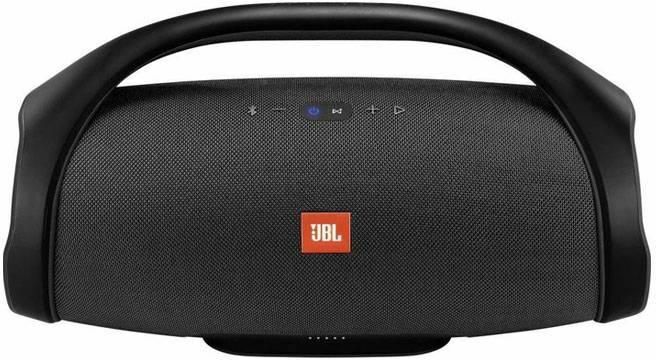 First of all it is impossible to believe that i bought Jbl boombox online in India for a price of 23,999 Rs as many leading e-commerce websites are selling the bluetooth speaker at a comparatively high price. Thanks Vplak for the fast delivery and providing a premium product at a low cost. I bought jbl boombox 2 weeks back. This thing is monstrous and wild. The sound is just rocking. It worths its name boombox. 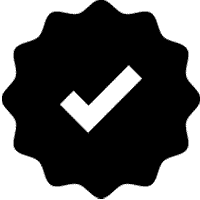 I got it at best price in india from VPlak. These big bluetooth speakers are priced awesome and powerful to play. thanks. The name of the product speaks for itself. It has got monstrous sound. I believe I got jbl big boombox at the best price in india, thanks to vplak. They always gives the best buy offers. 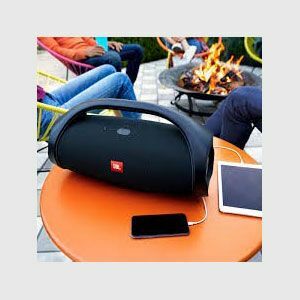 Coming to the speaker, the jbl boombox is incredible to hear. It comes with great playtime and high battery backup. And the big fat feature that steals the game is being waterproof. It was a decent purchase for jbl boombox big speakers. Got this boom box at best price from all over in India. 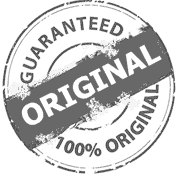 100% original and genuine product. No issue regarding delivery or this Bluetooth speaker. Well done VPLAK and keep it up. Soeaker is really a good choice. Really Great, Got at lowest price online. Thank you VPLAK team, Keep it up you guys are doing really Good. Jbl BoomBox is the perfect name given to this awesome Bluetooth speaker. Literally, it give my party the ultimate blast. Complete BEAST. Worth in this price. Thanks to VPLAK for their fast delivery and giving me the best price in online market. I had never written reviews but this speaker was just too amazing for me that I can't resist myself not to tell everyone about it. Its sound is crystal clear and very amazing. This is best product for all bass lovers!!! I’m literally in love with the Bass because it’s just wonderful. Well done JBL! And also, I want to thanks to VPLAK for delivery this precious product and getting me at best price online in India. Bass Is really Great. I think 20000 mah Battery is also an advance of this speaker. Waterproof I haven't tested yet but JBL Claiming it to IPX7 Rating Water proof. Overall I would Say It is really good speaker and VPLAK is also doing a good job . It delivers rich sound and high bass i.e. Premium JBL sound. One of the best sound I have ever listen in this small boombox speaker in this price range. 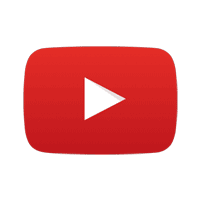 It gives me an option to change sound modes for indoor and outdoor parties or functions. Its really worth using it. Q: Does it have outdoor and indoor mode? A: Yes, it does in order to help you optimize your sound according to your location. 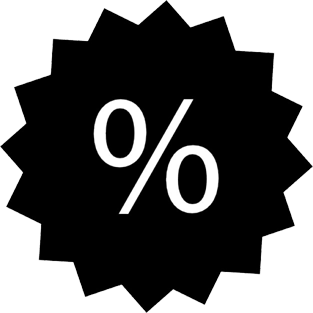 Q: How much time does it take to get charged fully? A: It takes about 4.5 hours to get charged fully. Q: Can it be submerged in the pool? A: Yes, it can because it has a rating of IPX7 which makes it rain, spills, splash and even submersion proof. Q: Can it be used to be played in a large party? A: Yes, it can. You can connect over 100 JBL speakers with it and play them together to enjoy amplified music. Q: How many maximum decibels can it reach up to? A: That is not mentioned in the product specs but it is definitely very loud. The Bluetooth transmission is 0-9dB and the signal to noise ratio is 80 dB. Q: What is its output power? A: In AC mode, the output power is 2*30W and in battery mode it is 2*20W. Q: Does the power need to be turned off while charging? A: No, you can charge it while playing music or having it off. Q: How powerful is the bass of the product? A: It has two 4-inch woofer and two 20 mm tweeter which helps in delivering deeper and richer bass. Q: Does it have 3.5mm jack for mp3 players? A: Yes, it does have an aux cable and a 3.5mm jack to plug in the same.